How many alternate guitar tuning possibilities are there? A LOT! 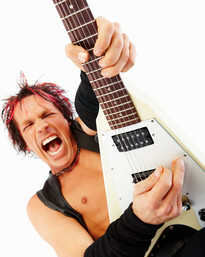 Some guitarists have claimed to have used over 50 tunings. How many do MOST guitarists use? Only a few so far. In this lesson, I have included only the most commonly used guitar tunings. Each section includes tuning tips and a link to a Guitar Pro tab and an mp3 example of the tuning. Important Note: The images of the tabs are not the clearest, so I included printable PDF files--just click on the image. Important Note 2: Be sure your guitar is in tune before trying any of these alternate guitar tuning ideas! 1. Play the 5th string at the 6th fret and tune your sixth string to that note (one octave down). 2. Re-tune your guitar to the new 6th string pitch. Play your 4th string open and tune your 6th string to that note (one octave down). 1. Play the 4th string open and tune the 6th string to that note (one octave lower). 2. Tune the rest of the strings to the new 6th string note. 3. Play the 4th string open and the the 6th string to that note (one octave lower). This is more commonly known as the "D A D G A D" tuning. 1. Play your 4th string open and tune your 6th string to that note (one octave lower). 2. Play your 5th string open and tune your 2nd string to that note (one octave higher). 3 Play your 4th string open and tune your 1st string to that note (one octave higher). Leave "Alternate-Guitar-Tuning" and Go to "Free Guitar Resources"
Leave "Alternate Guitar Tuning" and Go to "Absolutely Free Music Lessons"